Medaka (Oryzias latipes) is a popular animal model used in vertebrate genetic analysis. Recently, an efficient (~ 30%) knock-in system via non-homologous end joining (NHEJ) was established in zebrafish using the CRISPR/Cas9 system. If the same technique were applicable in medaka, it would greatly expand the usefulness of this model organism. The question of the applicability of CRISPR/Cas9 in medaka, however, has yet to be addressed. We report the highly efficient generation of knock-in transgenic medaka via non-homologous end joining (NHEJ). Donor plasmid containing a heat-shock promoter and a reporter gene was co-injected with a short guide RNA (sgRNA) targeted for genome digestion, an sgRNA targeted for donor plasmid digestion, and Cas9 mRNA. Broad transgene expression in the expression domain of a target gene was observed in approximately 25% of injected embryos. By raising these animals, we established stable knock-in transgenic fish with several different constructs for five genetic loci, obtaining transgenic founders at efficiencies of > 50% for all five loci. Further, we show that the method is useful for obtaining mutant alleles. In the experiments where transgene integrations were targeted between the transcription start site and the initiation methionine, the resultant transgenic fish became mutant alleles. With its simplicity, design flexibility, and high efficiency, we propose that CRISPR/Cas9-mediated knock-in via NHEJ will become a standard method for the generation of transgenic and mutant medaka. Medaka (Oryzias latipes) is a small freshwater teleost species. Similar to zebrafish (Danio rerio), medaka is a popular animal model for vertebrate genetic analysis and offers many advantages, including the availability of highly polymorphic inbred strains that can be effectively used for genetic mapping [1–3]. Transgenic animals with reporter expression in specific tissues or cell types are valuable tools, and many transgenic strains have been generated in medaka [1, 4]. Traditional methods for the generation of transgenic medaka, however, require promoter/enhancer hunting or bacterial artificial chromosome (BAC) modification, both of which involve time-consuming steps. Recently, the targeted knock-in of a reporter construct via a homology-dependent DNA repair was shown to work well in medaka using the CRISPR/Cas9 system . Although the technique is ideal for precise knock-in, it also requires time-consuming molecular cloning steps for the construction of a donor plasmid. In zebrafish, an efficient (~ 30%) knock-in system via non-homologous end joining (NHEJ) has been established . In this method, the co-injection of donor plasmid, short guide RNAs (sgRNAs), and Cas9 mRNA lead to the concurrent digestion of the genomic DNA and the donor plasmid, resulting in the incorporation of the donor plasmid into the genome. The technique does not require molecular cloning steps for the construction of a donor plasmid, and is now becoming standard for the generation of transgenic fish with reporter gene expression in a specific tissue. The technique has also been shown to be useful for the generation of mutant alleles . If the same technique were shown to be applicable in medaka, it would greatly expand the usefulness of this model organism. To date, however, this question has remained unresolved. We show that reporter constructs consisting of a medaka heat shock promoter (expected to work as a minimum promoter) and reporter genes integrated into the aimed genomic loci with high frequency via CRISPR/Cas9-mediated NHEJ; more than 50% of raised animals became transgenic founders. We further show that integrations can lead to the disruption of a gene when the integration was targeted between the transcription start site and the initiation methionine. Given its simplicity, design flexibility, and high efficiency, we propose that CRISPR/Cas9-mediated knock-in via NHEJ will become a standard method for the generation of transgenic and mutant medaka. Medaka adults, embryos, and larvae were maintained at 25–28 °C. All procedures were performed in compliance with the guidelines approved by the animal care and use committees of the National Institutes of Natural Sciences and Nagoya University. Animals were staged by days post fertilization (dpf). The parental strain for the generation of all transgenic fish was d-rR. The genetic background was Nagoya for ml-3 (sox5), orange-red variety for lf-2 (pax7a), and d-rR for pnp4a. Tbait (GGCTGCTGTCAGGGAGCTCATGG) sequence  was used as a bait sequence in donor plasmids. Two types of donor plasmids were used in this study: Tbait-hs-loxP-RFP-loxP-GFP and Tbait-hs-GFP. The hs represents the 0.8 kb sequence from the medaka hsp70 promoter (the hsp70.1 gene; ). The sequence was amplified by polymerase chain reaction (PCR) with primers: AGCTGCGTCACGTGGTCCCG (forward) and TGCTTTGTGCTGTAAAGACGC (reverse). Except for the usage of the medaka hs promoter, the constituents of Tbait-hs-loxP-RFP-loxP-GFP and Tbait-hs-GFP plasmids are essentially as described in  and . Zebrafish hspa8 promoter, approximately 2.6 kb in length [9, 10], was used to express Cre-mCherry-NLS  ubiquitously in early embryos. The zhsp8 promoter, Cre-mCherry-NLS, and bovine growth hormone (BGH) polyA sequences were placed in this order in the Tol2-based vector, pT2KXIGΔin . Microinjection of Tol2-based plasmid DNA into medaka embryos was performed as was done in zebrafish . Template DNA for sgRNA synthesize was PCR-amplified from pDR274  with the forward primer, ATTTAGGTGACACTATAgaxxxxxxxxxxxxxxxxxxGTTTTAGAGCTAGAAATAGC (for SP6 polymerase) or TAATACGACTCACTATAggxxxxxxxxxxxxxxxxxxGTTTTAGAGCTAGAAATAGC (for T7 polymerase), and the reverse primer, AAAAGCACCGACTCGGTGCC. The lowercase letters correspond to genome-targeting sequences (either 19 or 20 mer) in sgRNAs. The genome-targeting sequences in sgRNAs used in this study are shown in Table 1. After PCR amplification with Prime Star Taq polymerase (Takara, Otsu, Japan), PCR product was purified using a QIAquick PCR Purification Kit (Qiagen, Hilden, Germany). Template DNA thus obtained was used for the in vitro transcription of sgRNAs using a MAXIscript T7 kit (Life Technologies, Carlsbad, USA). pCS2-hSpCas9 (a gift from M. Kinoshita and F. Zhang; ) was digested with NotI, and Cas9 mRNA was transcribed using an mMESSAGEmMACHINE SP6 kit (Life Technologies). sgRNAs and Cas9 mRNA were purified using an RNeasy Mini kit (Qiagen). For the vacht and nr5a1 genes, we tested two sgRNAs. The sgRNA that yielded best results in F0 expression assay was chosen to generate stable transgenic fish (Table 1). For the sox5, pax7a, and pnp4a genes, we tested just one sgRNA for each gene (Table 1). sgRNAs and Cas9 mRNA were co-injected into one-cell stage medaka embryos with Qiagen miniprep (Qiagen) purified donor DNA. Each embryo was injected with a solution containing ~ 9 ng/μl of sgRNA for digesting Tbait, ~ 18 ng/μl of sgRNA for digesting genome DNA, ~ 200 ng/μl of Cas9 mRNA, and ~ 9 ng/μl of donor plasmid. Injection volume was adjusted such that approximately 30–75% of injected embryos were dead within one week after injection (Table 2). For insertion mapping, fluorescent F1 animals at 5–9 dpf were collected, and genomic DNA was extracted with standard protocols. The insertion status was examined on either the 5′ side or the 3′ side of the insertion. For example, to examine the 5′ side of the insertion, a PCR reaction was performed using a 5′ primer that was specific to each gene (upstream of the expected insertion site) and a 3′ primer that was specific to the donor plasmid (sequence within the hsp70 promoter for detecting the forward insertion, and sequence within pBluescriptSK for detecting the inverse insertion). To examine whether the tandem-array insertion in the same direction occurred, a PCR reaction was performed with the two primers within the donor plasmid. For the sox5 and pax7a transgenic fish, nucleotide sequences of PCR products were determined to examine the joint regions of the insertions. Images were taken using an MVX10 microscope (Olympus, Tokyo, Japan), an MZ APO stereomicroscope (Leica, Wetzlar, Germany), and an LSM700 confocal laser-scanning microscope (Zeiss, Oberkochen, Germany). For NHEJ-mediated knock-in in medaka, we employed an experimental scheme previously established by our group in zebrafish . Briefly, we co-injected sgRNA1 (for genome digestion), sgRNA2 (for plasmid digestion), donor plasmid, and Cas9 mRNA into one-cell-stage medaka embryos (Fig. 1a). The vacht (vesicular acetylcholine transporter; also called slc18a3) gene, which is known to be expressed in cholinergic neurons (motoneurons, primarily), was chosen as an initial target. The donor plasmid (Tbait-hs-lRl-GFP) contains a bait sequence (Tbait; ) upstream of the insertion cassette for sgRNA2-guided DNA cleavage. This bait sequence was selected because the corresponding sgRNA (sgT) appears to have no off-target site in the medaka genome (Additional file 1: Table S1). Tbait is followed by a medaka hsp70 promoter, which we expect to work as a minimal promoter (Fig. 1b). In this study, we extracted a 0.8 kb sequence of the medaka hsp70.1 promoter (see Methods) for this purpose. The hsp70 promoter is followed by the loxP-RFP-loxP-GFP (lRl-GFP) sequence (Fig. 1b). Without application of Cre recombinase, RFP will be expressed as a reporter gene. The target site for genome digestion was set upstream of the prospective transcriptional-start site of vacht (Fig. 1b; the sequences used are shown in Table 1). Concurrent digestion of the genome (guided by sgRNA1) and the plasmid DNA (guided by sgRNA2) with Cas9 would result in the integration of the donor plasmid into the genome via an NHEJ (Fig. 1b). We tested two sgRNAs (vacht-sg1 and vacht-sg2; Table 1). Injected animals were investigated for their RFP expression around the hatching stage. In the case of vacht-sg1, we found animals that showed wide-spread RFP expression in the trunk motoneurons (Fig. 1d; 1c is a control animal) in 55% (11 of 20) of the animals (Table 2). The remaining 45% of the animals either showed sparse RFP expression in the motoneurons (Fig. 1e) or no expression. In the zebrafish experiments, there was a strong correlation between the expression levels of a reporter gene in injected animals and the probability of becoming transgenic founders. Animals that had good reporter gene expression had a high probability of becoming positive founders . Thus, we raised only those animals that were considered to have “good expression” (Fig. 1d; Table 2). The raised animals were crossed to wild-type to examine if they would produce fluorescent offspring. Among 10 fish screened, five produced larvae with RFP expression in the motoneurons (Fig. 1f; Table 2). The expression patterns of RFP in these Tg [vacht-hs:lRl-GFP] transgenic fish were similar among progenies from different founders. We investigated the insertion sites of each line by PCR, and found that, in all cases, the transgene was integrated around the expected site in the genome. As was seen in zebrafish, both forward-direction integration and reverse-direction integration were observed. Moreover, in some cases multiple copies of donor plasmid were integrated (Additional file 2: Table S2). The medaka hsp70 promoter employed in this study showed activity in female germ cells. Embryos produced from transgenic females showed ubiquitous red fluorescence due to the maternal effect (Fig. 1g). Expression levels were variable even among progenies from the same female (Fig. 1g). This maternally-derived fluorescence became negligible at around 3 dpf, and thus did not represent a major problem for observation of RFP-labeled motoneurons at later stages. The maternally derived fluorescence was also observed in other lines generated in this study. The reporter sequence (loxP-RFP-loxP-GFP) in the Tg[vacht-hs:lRl-GFP] fish described above was aimed such that RFP expression could be converted to GFP expression by the application of Cre. To conveniently change RFP transgenic fish to GFP transgenic fish, we generated transgenic medaka that ubiquitously express Cre-mCherry-NLS fusion protein  in early embryos. For this purpose, we used the zebrafish hspa8 promoter, which is known to drive gene expression ubiquitously in early zebrafish embryos [9, 10]. Tg[zhsp8:Cre-mCherry-NLS] transgenic medaka was generated by a Tol2-based transgenic method (Fig. 2a). Transgenic embryos of this line expressed Cre-mCherry-NLS proteins ubiquitously in the early stages (Fig. 2b). We crossed this Tg[zhsp8:Cre-mCherry-NLS] fish to Tg[vacht-hs:lRl-GFP] transgenic fish. As expected, we obtained larvae that expressed GFP instead of RFP in the motoneurons (Fig. 2c). The GFP-expressing animals were raised to adulthoods, and crossed to wild-type fish. Approximately one-half of the fish expressed GFP in the motoneurons; no RFP-expressing fish were obtained. These results indicate that RFP transgenic fish can be genetically transformed to GFP transgenic fish (Tg[vacht-hs:GFP]) by crossing alone. Next, we chose the nr5a1 (also called ftz-f1) gene, and examined if the same technique worked for this gene. The nr5a1 gene is known to be expressed in cells in the hypothalamus (hp), interrenal gland (ir), and gonad (g) (; see also Figs. 3e and f). We tested two sgRNAs (nr5a1-sg1 and nr5a1-sg2). In both cases, the target sites were set upstream of the prospective transcription start site (Table 1), like the experiments with the vacht gene. We performed microinjections with the Tbait-hs-lRl-GFP (see, Fig. 1b). In the case of nr5a1-sg1, we observed animals that had RFP expressions in the expression domains of nr5a1. Compared to the experiments with the vacht gene, the expression of RFP in these tissues in the injected animals was more difficult to see, because strongly auto-fluorescent red pigment cells were located near the tissues where nr5a1 was expressed (see Figs. 3a–d). We selected three animals (out of 31 survivors) that had good RFP expression in these tissues, and raised them (Table 2). Of these three fish, only one survived to adulthood. The survivor was crossed to a wild-type fish, and it turned out that the fish was a positive founder (Tg[nr5a1-hs:lRl-GFP]). RFP expression in the transgenic fish was observed in the expected tissues (hp, ir, and g in Figs. 3a–d). No GFP expression was observed in the transgenic fish (Figs. 3c' and d'). We investigated the insertion site of the line by PCR, and found that the transgene was integrated in the expected site in the forward direction as a single copy (Additional file 2: Table S2). We then examined if RFP fish could be converted to GFP fish by crossing. A Tg[nr5a1-hs:lRl-GFP] transgenic founder was crossed to Tg[zhsp8:Cre-mCherry-NLS] fish. This resulted in the production of animals in which GFP instead of RFP was expressed in the hypothalamus (hp), interrenal gland (ir), and gonad (g) (Figs. 3e and f). The animals were raised to adulthood, and were then verified to produce GFP-expressing fish. These GFP transgenic fish did not express RFP (Figs. 3e' and f'). Thus, RFP transgenic fish were converted to GFP transgenic fish, resulting in the establishment of Tg[nr5a1-hs:GFP]. In the knock-in experiments for the vacht and nr5a1 genes, we did not aim to disrupt gene functions. The insertion sites were set upstream of the genes, not in the exons. In zebrafish studies, the NHEJ-mediated knock-in technique has also shown to be effective for obtaining mutant alleles by inserting the transgene into exons . This led us to examine whether this is also the case in medaka. pax7a (paired-type homeobox) and sox5 (sry-related high-mobility-group box) were chosen as initial target genes, because mutations of the genes lead to skin pigmentation defects [16, 17], and the phenotypes can be identified easily by the absence or increase of pigment cells. We used Tbait-hs-GFP as a donor plasmid (Fig. 4a). The target sites were set between the transcription start site and the first methionine (Fig.4a and Table 1). We performed microinjection, and with high probability, obtained animals that had broad GFP expression in the expression domains of pax7a (tectum, hindbrain, etc. ; see also Fig. 4b–d) or sox5 (CNS from the forebrain to hindbrain, dorsal neural tube, etc. ; see also Fig. 4e–g). We raised those animals that were considered to exhibit good expression (Table 2), and crossed them to wild-type fish. We obtained 6 pax7a-transgenic founders out of the seven fish raised (85.7%). The expression patterns of GFP were similar among the progenies of different pax7a-transgenic founders. Examples are shown in Fig. 4b–d. 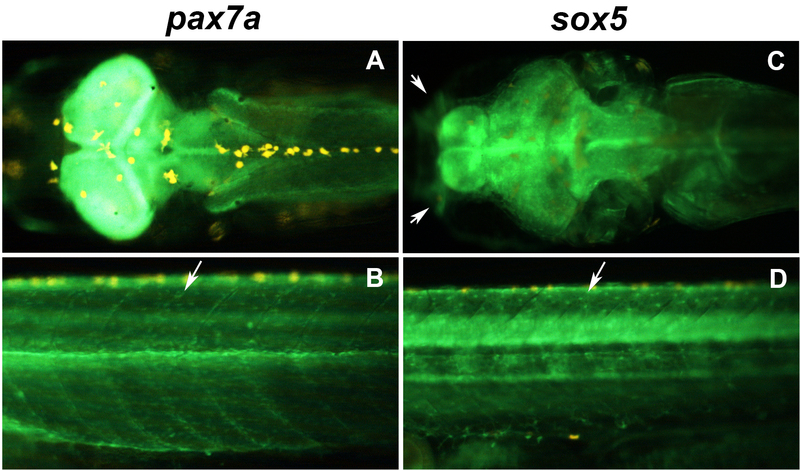 The fluorescent signals in the progenies of these founders mimic the endogenous pax7a expression, including the tectum, hindbrain, anterior neural tube, somites and pre-migratory neural crest (Fig. 4b–d), and presumable pigment cell precursors on the body surface (progenitors of xanthophore and leucophore) (see also Additional file 3: Figure S1A and B), as previously reported . We also obtained seven sox5-trangenic founders out of the 10 raised fish (70%). The expression patterns of GFP were similar among the progenies of different sox5-transgenic founders, and mimic the endogenous sox5 expression in a range of the central nervous system (CNS) from the forebrain to hindbrain, dorsal neural tube (Fig. 4e–g, see also Additional file 3: Figure S1C), and a portion of pre-migratory neural crest (Fig. 4f') and presumable xanthophore precursors (Fig. 4g, see also Additional file 3: Figure S1D). The analyses of the insertion status with PCR revealed that, except for one case, the transgene was integrated at the expected location with several forms: forward, reverse, and multiple copies (Additional file 2: Table S2). In one case, PCR analyses failed to detect amplicons on both of the 5′ and 3′ sides (#5 strain for sox5; Additional file 2 Table S2). In this transgenic fish, large deletions that exceeded the locations of 5′- and 3′-gene specific primers might have been introduced in the genomic DNA when the integration occurred. To reveal the sequences of the joint regions of each transgenic strain, we performed sequencing experiments for the PCR products that spanned the genomic DNA and the donor DNA (Additional file 2: Table S2). The results, which are presented in Additional file 4: Figure S2, show that indels were frequently introduced in the joint region, as was seen in the previous study . We investigated whether the insertion led to disruption of the gene function. To do this, we crossed one of the transgenic founders to a homozygous mutant of pax7a or sox5, which has defects in skin pigmentation: the pax7a homozygotes lack yellow xanthophores and white/orange leucophores, and the sox5 homozygotes exhibit an absence of xanthophores and excessive formation of leucophores. We found that all of the progeny fish with GFP expression showed the phenotypes of the mutants deficient for the corresponding targeted gene, pax7a (Fig. 5a–g) or sox5 (Fig. 5j–p). The GFP-positive pax7a trans-heterozygous larvae (pax7a GFP/lf-2 ) lacked xanthophores and leucophores (Fig. 5d–e), phenocopying the pax7a mutant lf-2 (Fig. 5f–g). These larvae had GFP-positive cells in the skin (presumably xanthophore progenitors and leucophore) (Fig. 5i), as was seen in pax7a heterozygotes (pax7a GFP/+ , Fig. 5h), suggesting that pax7a function is not required for the formation of the GFP-positive bipotent progenitors, but is for the differentiation of xanthophores and leucophores. Likewise, GFP-positive larvae (trans-heterozygous for GFP insertion and the sox5 mutation) had excess leucophores and lacked xanthophores (Fig. 5m–n), phenocopying the sox5 mutant ml-3 (Fig. 5o-p). The GFP-positive cells were almost completely absent from the dorsal surface of the trunk in sox5 GFP/ml-3 larvae (Fig. 5r; compare with wild-type in 5q), suggesting that sox5 is required for the formation of GFP-positive xanthophore precursors. Non-GFP fish showed essentially normal pigmentation, although we occasionally observed non-GFP fish with the mutant phenotypes. This could be due to the induction of independent indels (induced by CRISPR/Cas9) in the sox5 locus in different germ cells of the founders. In any case, the results indicate that the insertion of the transgene led to disruption of the gene function. Next, we performed experiments in another gene, guanineless (gu)/pnp4a. Mutations of this gene are known to result in defects of guanine formation in iridophores and to result in less-pigmented eyes and abdomens. pnp4a expression has been observed in the eye and abdomen at 3–4 dpf with in situ hybridization . As was done in pax7a and sox5, the target site was set between the transcription start site and the first methionine (Table 1). We performed microinjections to the d-rR strain, which is wild-type at the gu/pnp4a locus, and screened for fish with good expressions of GFP (Table 2 and Fig. 6a, b). These fish were raised to adulthood, and three transgenic founders (producing GFP-positive F1 fish) were identified out of six fish. The expression patterns of GFP in F1 fish were generally similar across strains, and donor plasmid was knocked-in at the expected site in all founder fish (Additional file 2: Table S2). One GFP-positive founder fish was crossed with homozygous gu/gu mutant, which has a deletion of exon 4–7 at the pnp4a locus . Among the F1 progenies obtained, GFP-positive fish showed less pigmented iridophores in the eye (right-side embryo in Fig. 6c, d) and GFP-negative fish showed the wild-type phenotype as expected (left-side embryo in Fig. 6c, d). Among the offspring obtained, 16 GFP-positive offspring had the less-pigmented phenotype (guanineless phenotype) and 10 GFP-negative offspring had the wild-type phenotype (Fig. 6e, f). These data indicate that the donor plasmid was knocked into the gu/pnp4a locus and induced a loss of function mutation at the gu/pnp4a locus. In zebrafish, we have previously shown that knock-in transgenic fish can be efficiently generated via NHEJ by co-injection of two sgRNAs (one for the digestion of the genome and the other for the digestion of donor plasmid), donor plasmid, and Cas9 mRNA. Here, we have shown that the same method is perfectly applicable in medaka. Injected animals frequently show reporter gene expression broadly in cells where targeted genes are expressed (frequency, 30–50% for three of the five genes (vacht, sox5, and pax7a) and 10–20% for the other two genes (nr5a1 and pnp4a); in total, 27% (47 of 177); Table 2). By raising those animals to adulthood, we were able to obtain transgenic founders with very high frequency. Efficiencies exceeded 50% for all five genes (Table 2). Thus, we have succeeded in establishing a highly-efficient knock-in system in medaka fish. The frequency obtained in this study was higher than that in zebrafish where 5–10% of injected animals usually show “good expression”, and approximately 30% of raised animals became positive founders . One potential reason that accounts for these higher frequencies is the slower development of medaka embryos compared to zebrafish embryos [20, 21]: In medaka, there may be more opportunities for the donor plasmid to integrate in the very early developmental stages. The NHEJ-mediated knock-in method described here has one clear advantage over the homology-based recombination technique that was recently described by . The current method does not require any DNA construction experiments. By contrast, recombination techniques based on long-homology arms require DNA construction steps. One clear disadvantage of the NHEJ-mediated knock-in system is that it is not suitable for precise knock-in. As shown in Additional file 4: Figure S2, indels were frequently introduced in the joint region, similar to the previous study . For experiments in which precise knock-in is critical, methods that rely on homology-dependent repair systems (i.e., ) need to be employed. In this study, we demonstrated that mutant alleles can be efficiently generated by NHEJ-mediated knock-in. For all three of the genes tested, we succeeded in obtaining mutant alleles with high frequency (Table 2). The basic experimental design was that the reporter gene construct (Tbait-hs-GFP) was targeted to be introduced between the transcription start site and the first methionine. This method has several advantages compared to conventional knock-out methods of introducing indels. First, the evaluation of sgRNAs can be achieved readily by screening reporter gene expression in injected animals. The time-consuming molecular biology steps, including DNA extraction, PCR reaction, and sequencing, are not needed. Strikingly, in the present study, we tried only one sgRNA for each of the genes (sox5, pax7a, and pnp4a) and obtained good results in all cases (Table 2). Second, upon establishment of mutant alleles, the strains express a reporter gene in the expression domains of the gene of interest. This makes it possible to monitor the morphological defects of the affected tissues by the expression of the reporter gene. Third, the presence of the reporter gene is greatly beneficial for selecting animals that will inherit the mutant allele in future generations. As we did in zebrafish, we knocked in constructs with the hsp70 promoter (Figs. 1b and 4a). For this, we extracted a 0.8 kb sequence from the promoter of the medaka hsp70.1 gene . We showed in this study that this fragment works well as a basal (minimal) promoter. There are several advantages to utilizing the hsp70 promoter in DNA constructs for knock-in. First, the efficiencies of obtaining transgenic founders are likely to be increased, as reporter gene expression occurs irrespective of the direction of integration. Indeed, we found both types of integration (including multi-copy integrations) in the transgenic lines generated in this study. Second, the reporter construct can be targeted virtually anywhere near or within a gene of interest. This feature gives researchers flexibility in designing sgRNAs. There are two potential disadvantages or concerns regarding the usage of the hsp70 promoter. First, the promoter has activity in female germ cells. We observed maternally derived fluorescence in many of the lines generated in this study. Although this did not present major problems in the present study, it could be a problem for monitoring the expression patterns of genes in the early stages. Nonetheless, this problem can likely be overcome, in many cases, by using transgenic males for mating. Second, gene expression may not be completely recapitulated with the usage of a heterologous promoter. Although reporter gene expressions appeared to mimic the expressions of the endogenous genes in the transgenic fish generated in the current study for all five of the genes, the possibility of an occurrence of ectopic expressions cannot be completely excluded. Indeed, we have noted an ectopic expression in a Tg[evx2-hs:Gal4] transgenic fish strain in the case of zebrafish . Thus, researchers need to be aware of the potential occurrence of an ectopic expression when using the hsp70 promoter. In this study, we showed that RFP expression can be changed to GFP expression in transgenic fish with the loxP-RFP-loxP-GFP construct. To make this occur ubiquitously, we established Tg[zhspa8:Cre-mCherry-NLS] in which the Cre-mCherry-NLS fusion protein is expressed ubiquitously in early embryos. Using this line, one reporter gene was easily converted to another reporter/driver gene by crossing alone. This is a powerful system for establishing transgenic fish that express a reporter/driver gene that is itself not fluorescent (without the aid of fluorescent reporters, prescreening before raising animals is not possible). For example, we succeeded in establishing several Gal4 driver lines using this system in zebrafish (our unpublished observation). In these studies, we first established loxP-RFP-loxP-Gal4 lines, and RFP was then converted to Gal4 by utilizing Tg[zhspa8:Cre-mCherry-NLS] transgenic zebrafish. The same strategy could be used to generate transgenic medaka that express reporter/driver genes that are not fluorescent themselves. We report that the NHEJ-mediated knock-in system is highly efficient in medaka, and is very useful for establishing mutant alleles. With its simplicity and high efficiency, we propose that the method described may become a standard technique for the generation of transgenic and mutant medaka. We thank the Medaka National Bioresource Project (NBRP Medaka), which is supported by the Japan Agency for Medical Research and Development, for providing the d-rR (MT837) and gu (MT827) strains. We also thank Ms. T. Yamazaki, H. Ito, and Y. Terasawa for their excellent technical assistance. This work was supported in part by grants from the Ministry of Education, Science, Technology, Sports and Culture of Japan. Donor plasmids, as well as their sequence information, are available from the Medaka National Bioresource Project in Japan (NBRP Medaka). SH conceived and designed the study. IW performed the major parts of the experiments. YK helped some of the experiments that IW performed. HH performed the experiments related to the sox5 and pax7a genes. SY and KN performed the experiments related to the pnp4a gene. All authors contributed to the writing of the manuscript. All authors read and approved the final manuscript. Fish were maintained and used in accordance with the guidelines approved by the animal care and use committees of the National Institutes of Natural Sciences (approval number: 17A002) and Nagoya University.